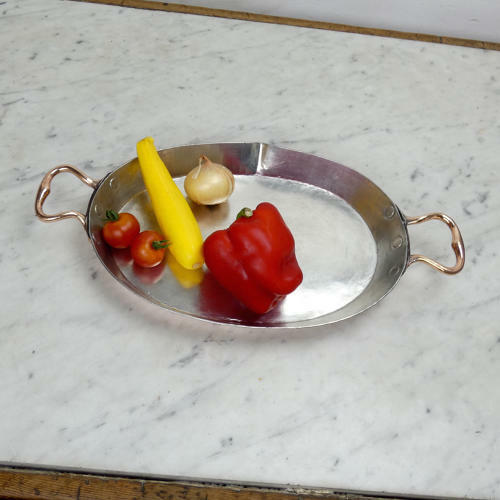 A very unusual French copper baking dish with a pouring spout. This shape of dish is often referred to as a gratin dish and would have been used for various vegetable gratins. This one, however, would have been used for baking meat or fish as the spout would have been for pouring off the juices. It is well made, from a heavy gauge of copper, and it dates from c.1880. It has the typical shape of French, brass handles to either end. It is in excellent condition and the interior has been re-tinned so that it is suitable for use.